This great shot was taken at the Botanical Gardens Rhyl in August 1963 and at the time the above vehicle was owned by the Foden Sports and Social Club but it was delivered new to Hargreaves of Bolton. Bodywise is it called an Observation Coach or an Half-deck Coach? I can understand why it ended up with a sports a social club I should imagine that the large luggage locker came in handy for carrying all that equipment. Another question regarding this type of body I have is, were they limited to double decker regulations of length and weight for example or were the single decker lengths and weights allowed? The PVSC6 had the Gardner 6LW 8·4 litre six cylinder diesel engine there was the option of the Gardner 5LW 7·0 litre five cylinder diesel engine in which case it was designated the PVSC5. In 1949 the Foden FE6 4·0 litre two stroke diesel engine was available which was designated the PVFE6 but only 52 PVFE6s were built as the series was superseded by the rear engined PVR in 1950. I can’t answer any of the technical questions about this coach, but I always remember these because Dinky Toys made one in the late 1950s and I had one; but to this day I’ve never seen an example of the real thing. There’s an example of the Dinky version here. Yes, KC – I’d forgotten about these. I used to have one. Weren’t they Maudsleys? It would be interesting to know why Dinky should choose such an unusual design of body and comparatively rare chassis for their model, especially when they were soon to become obsolete in style. Didn’t Dinky do one in BOAC livery? I seem to remember the full-sized versions plying between Heathrow and the BOAC city terminal somewhere near Gloucester Road station – in the days before Heathrow Express, or even the extension of the Piccadilly Line beyond Hounslow West. A couple of model makers made versions of airline-related coaches. Its an observation coach, and Whitson built them on Maudslay, Leyland, AEC, and Foden chassis between 1949 and 1952. A half-deck coach is a different beast altogether using the patented "Crellin-Duplex" design where upper and lower deck seating was arranged to cram as many people in as possible using interlocking "railway compartment" style seating. The end result looked more like a two-level horsebox than a PSV! In prewar years Duple built a few observation coaches (I seem to remember one for an operator in South Wales) but in the post-war period Whitson had a virtual monopoly. The only other post-war example which springs to mind is the Mulliner bodied Morris-Commercial built for the Morris Works Band. This is preserved at the Oxford Bus Museum, but sadly none of the magnificent Whitson vehicles has survived. The most famous Whitson observation coaches were the Fodens used by Salopia, but Dinky Toys chose to use a Maudslay supplied (in real life) to Embankment of Plymouth as the prototype for their scale model. The airport coaches you mention were (in a sense) observation coaches, and share the same PSV Circle body prefix (RC) but all of those used by BEA in London (bodywork by Park Royal) and by MCTD in Manchester (bodied by Burlingham and Bond) had a continuous roofline rather than the "stepped" arrangement of a true observation coach, Liverpool Corporation converted a few (previously conventional) single-deckers to this "stepped roof" format in the late 1950s for their own airport service. The vehicles which resulted were not an aesthetic triumph! As has already been pointed out, there was a world of difference between the Observation Coach style and that of the Half-Decker. Both were built to the (then) size limits for single deckers, rather than being restricted to the double decker dimensions. This applied regardless of whether they were mounted on front-engined chassis or rear-engined/underfloor-engined chassis. EWH 195 was one of a pair supplied to Hargreaves of Bolton, the other one being EBN 898. Both were supplied as PVSC6 chassis (Gardner 6LW), but after Fodens acquired EWH 195 they fitted a Foden two-stroke engine, effectively converting it to PVFE6 specification. Incidentally, you can tell the difference between front engined Gardner powered and Foden powered PSVs by the position of the starting handle hole. 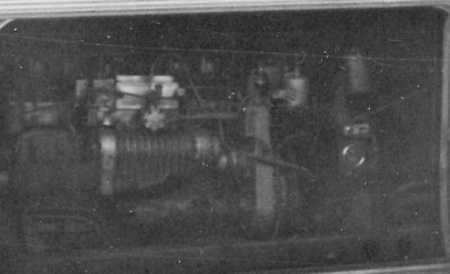 In the case of the Gardner engine the hole is dead centre, whereas it is slightly offset to the offside when a Foden engine was fitted. I should imagine this was carrying the Foden band who performed all over the country, they had several Fodens over the years, some had a bandmaster mascot on the rad cap, a uniformed conductor (the musical type) waving a baton. I too had the Dinky model but I also remember the actual bus around North Wales when I was a small boy in the late 1950’s-early 1960’s. I lived in Broughton and we always holidayed further up the coast so saw this bus quite regularly. I also liked the cream-liveried Crosville buses which seemed more exotic than the all green or green and cream Chester buses. I agree with Bryan Yates’ assumption that this coach was carrying the Fodens Brass Band. My father was a Machine Shop Foreman until his death in 1964, and I can remember seeing the bus now and then around the Elworth works – if memory serves me well it was grey and blue, and sounded as though it had the 2-stroke engine. No doubt the extra storage was useful for the band instruments. On another note, I saw a red half-cab Foden coach at Astle Park steam rally in August – still in the Coppenhalls (Sandbach) coach firm’s livery. Lovely memories! Reference to Malcolm’s comments about the blue and grey coach for the Foden Works Band…. I was sent a photo a couple of days ago from a friend in the UK who saw what is probably this gorgeous looking old lady just last week at a rally in Newbury….If I knew how to load photos on to this site I’d do it, but maybe a quick Google would stir the memory cells into action, and might also provide more information about its current owners’ show schedule and dates…. Ah….An hour later and I would be kicking myself unmercifully if the old limbs could bend that far…. I’m sure that it’s just an age thing on my part, but what an absolutely wonderful example of what a British coach was meant to look like…. She’s a very attractive vehicle and the colour scheme certainly enhances her looks, too, Stuart. How many Whitson Observation Coaches were made. I’ve just been doing some research on Whitson’s observation coaches and the answer to "how many were built" seems to be 32 or 33. The biggest customer was the US Air Force which took either nine or ten (depending on which source you believe!) on 30 ft long Crossley SD42/9 chassis. These received the USAF serial numbers N967-976 (or N969-977 in one version, hence the discrepancy in total build numbers). They carried pseudo-Foden radiator grilles at the request of the customer and were delivered in 1951 for use on personnel transfers and by assorted USAF military bands. 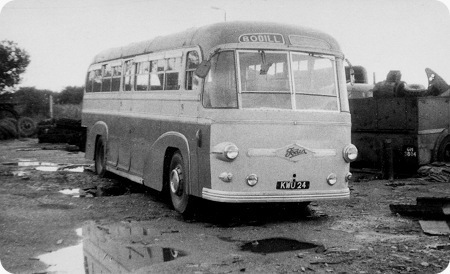 They appear to have been withdrawn in 1959 and at least one of them (N975) was subsequently sold to a civil operator (Peters of Llanarmon) as TCA 309. It was scrapped in 1962. Next came Salopia Saloon Coaches of Whitchurch and Embankment of Plymouth with five each. Salopia’s were all on Foden chassis, one of the shorter version on PVSC6 chassis (GAW 86), a 30ft long PVFE6 (GUJ 243) and three of the 30 ft version on rear-engined PVRF6s (HUJ 996/7 and JAW 334). Embankment took two on Maudslay Marathon IIIs (EJY 123/4), two on AEC Regal IIIs (FDR 52/3) and one on a Foden PVSC6 (GCO 946). Four operators had two each. Hargreaves of Bolton took EBN 898 and EWH 195 on Foden PVSC6 chassis, HS Knight of Northampton received BNH 301 (Maudslay Marathon III) and BNH 302 (AEC Regal III), AE Marsh T/A Black and White of Harvington (Worcs) had Marathon IIIs HNP 875 and HUY 204), and ET Straw of Leicester bought Regal III GBC 893 and Regal IV HBC 603. WEMS of Weston-super-Mare received Marathon III DFR 395. This vehicle was apparently the prototype – it had a slightly higher roof-line on the raised section – and had been an exhibit at the Earls Court Show in Batty Holt livery which might account for its Blackpool registration as they had a subsidiary there. However, it never entered service with the Lancashire firm and stayed with WEMS until 1960. Other one-off customers were Cowell Bros of Sunderland (Regal III AGR 975), Doug Jones Coaches of Newchurch (Hants) who took Royal Tiger JOT 616 – the only Leyland example, Netherfield of Nottingham (Regal IV NAL 393), and Stanton Bros of Horseley Heath (Staffs) with Marathon III RRF 328. Second-hand operators of observation coaches (apart from the previously mentioned Peters of Llanarmon) included Cooper of Gilesgate (Durham) who took two former Salopia PVRF6s, Elms Coaches of Kenton (London) who bought Embankment’s Foden GCO 946, and Ubique (also in the London area) who bought RRF 328. Can anyone tell me of any I’ve missed? Past experience would suggest that there might be others lurking where I’ve failed to notice them! The body came in two basic versions. The shorter variety can be recognised by having two full window bays on the sides of the raised section, while the 30 ft version has three. Both types could be adapted to suit any engine position (front/underfloor/rear). In closing, can anybody tell me the liveries used by HS Knight of Northampton (taken over by York’s in 1960) or Stanton of Horseley Heath (who disappeared in 1956)? I have black and white shots of these operators’ vehicles and would like to get an idea of what they looked like in technicolour! GAW 86 One of the Salopia Fodens was converted to a Lorry are there any photos around? I understand that there was possibly another one but records are unclear OFR 922 any one know anything about this one. The top photograph first appeared on the ‘Do You Know’ page of this website and the following information was forthcoming. The shot was taken in a scrap yard when this particular vehicle was presumably at the end of its days. It states that it was owned by Bodill Builders Contractors who were probably the last owners and used it as a staff vehicle. Originally it was owned by Beehive Services who were based at Adwick-le-Street (near Doncaster) and founded by Ernest Arthur Hart after he retired from being a centre-half footballer for Leeds-United and England in the 1930s. Beehive Services was eventually taken over or amalgamated with Wilfreda from Bawtry to form Wilfreda Beehive of Adwick-le-Street. Wilfreda Beehive still operate as a bus and coach operator in the South Yorkshire area and one thing I spotted on their website is that they have Routemaster for private hire. If anyone is interested in engine shots let me know it may be possible with a bit of tweaking to bring out more detail which I would then post here. Fascinating how there is a blur between unconnected coachbuilders. I know Whitson and Duple were north London neighbours, but that’s a Duple rear end! Three or four years before Duple’s takeover, Burlingham put a Duple rear end on the Seagull (from 1957/8) and of course there was the famous and ubiquitous Alexander R type clone by East Lancs on various rear engined decker chassis. These were companies independent of each other and it doesn’t take account of the fifties period when the same style could bear Crossley, Park Royal or Roe plates depending on which factory built them. Come to think of it, though, Southdown had about 10 Beadle/PD2s built on Park Royal frames. They were virtually indistinguishable from the real thing – but no formal link between the companies. They were also Beadles last deckers, and possibly their last bodies, before concentrating on the car sales side of their business. I have little to go on apart from hunch & haze, but were Harts really Beehive’s competitor Kildare Coaches (note Irish link) and Beehive the Co-op (A Beehive is a symbol the Co-op used)? Or is that wrong? It isn’t just the rear view that reminds you of Duple, from that front three quarter view don’t you think the sides of the vehicle look a bit like a Duple Roadmaster?. On the subject of lookalike bodies can I throw into the conversation the similarities between the Northern Counties bodies fitted to Yorkshire Traction Atlantean and Fleetlines, Roe bodies of that era (West Riding / Rotherham Corporation for example) and some Alexander (AL?) bodywork. Andrew. There is quite a history of putting Alexander screens and front ends on unrelated companies bodies. In addition to those you have mentioned, there were Atlanteans for Newcastle Corporation and Fleetlines for Bradford with MCW bodies. You are absolutely right. Apart from the immediate windscreen area, it does look just like a Roadmaster. Wonder whether they were Duple frames (in the same manner as the Southdown PD2s mentioned above with Park Royal frames)? I can confirm that Whitson, the coachbuilder, had no direct connections with Duple and were actually West London based, firstly at Sipson, then at Yiewsley. Their managing director, Alf Whittit, was a fiercely independent and somewhat flamboyant salesman with a liking for the stylish designs for which Whitson became well known. Initially their draughtsman was Charles Pilbin, whose style tended to be functional rather than beautiful. This changed with the arrival, from Duple, of Cyril Austin. It may be that Cyril Austin was aware of, perhaps even responsible for, some of the Duple styling that people can see in the Whitson body. I can also confirm that E A Hart Limited (fleet name Beehive Services) were the company that bought the Fodens – there were actually four of them KWU 24 to 27. Control had passed to Doncaster Co-op in July 1947 and E A Hart left to set up another company – Kildare Coaches of Knottingley. 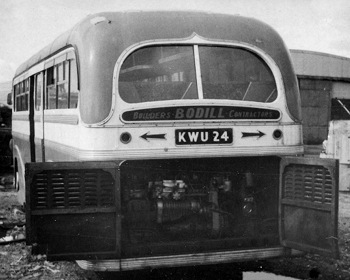 KWU 24 itself survived the yard in which it was photographed. I have a photograph showing it in the service of Carlien’o Brothers Circus, but still carrying Bodill names on the front. Thanks Peter, my mystery above is solved- Kildare, Beehive and Hart’s, although Beehive was a "logo" of the Co-op. I thought that Kildare, though (also) had a garage in neighbouring Carcroft, and then in Adwick itself, where they seemed to compete with Beehive. Unity Coaches at Clay Cliffe Road Baraugh Green Barnsley also ran rear engined Fodens. They were owned by the Barnsley British co-operative Ltd. and were in a rather strange brown and tan livery if I’m not mistaken. They were bought out by Cawthorne’s in the late ’50’s. Unity/Beehive- good Co-op words. Sounds like a Co-op-Foden connection: like the Co-op branch buildings, they were meant to last! KWU 24 spent the rest of it’s PSV life with R.E. Everson Everson’s Coaches of Wix Nr. Manningtree in Essex, where it was joined by JOT 106 A Foden PRFG with Associated Coachbuilders C41C Body. KWU was C39C. It was painted in red and cream and gave magnificent trouble free service for three years – a wonderful vehicle. I would love to see a closer view of the engine compartment. For the attention of Wally Francis whose details I collected here. In 1955 a Commer TS3 with a Beadle body was supplied by my old boss, Ernie Harris of Fishponds Motor Co. Ltd. Bristol and I had been a young lad who had kept it, and the Garage showroom up together while I was employed. I would love to hear how long this vehicle lasted and exactly what had happened to it. The business had been done to Eversons Coaches of Wix, and I have 2 pictures – one somewhere close to town and the other parked in a stream of traffic outside of the Company premises. I do hope that this meets up with some conversation and I would love to hear further. UHT was a wonderful coach and made it in the fleet into the new livery of Red/white and grey – lasting ten years in the fleet – traded in to Moseleys and sold by them as a non- psv and turned into a mobile home spent time in the Clacton area funnily enough. Would love to see your photographs!!! Where were Page bodies built and what was the full name of the firm? Any photos of their products including 79 BPU mentioned.? Would like to know more as I have not heard of this bodybuilder before. I think that the builder of the "Page" body referred to by Mike Holloway was Page or Page & Scott of Colchester who were principally car dealers. I ought to remember more as my late great uncle worked for them and I think at one point lived over the premises. Ultimately Page & Scott were acquired by George Ewer & Co who were not exactly unknown in the coach industry. It was great to hear about the two Fodens and Commer TS3 belonging to Everson’s coaches. I went to school on all these. On one occasion the fan on KWU came off, and being a rear engined coach, it crashed through the rear doors and fell onto the road behind. Lots of other memories of those journeys and of working for Everson’s as a Saturday job. If Wally Francis, who I worked with for three years, wishes to make contact I’d be delighted! I well remember this coach belonging to Beehive and taking our local Brass Band to Cardiff and later to Plymouth during the mid fifties. It was in dark green and cream. I was an apprentice to YTC in the sixties and remember looking round ‘Askins’ scrap yard during the dinner hour at a very tired Foden coach being scrapped, it had of course a Foden 2 stroke engine and an angle drive transmission. It begs the question why did Leylands struggle for so long perfecting the PDR 1 when the technology was already there? It took an overheard apprentice’s comment to get them to find an oil which would do both jobs of lubricating the diff and the angle drive and the gearbox after so many failed seals and g/b brake bands. After a long and frustrating struggle to change the throttle pins on the Atlants. an apprentice was again heard to shout out in frustration, ‘Why don’t Leylands fit a hydraulic throttle to these camels? The next batch duly came fitted with Hydraulic throttles. I now live in Australia, formerly of Fern Bank, Adwick le Street. My Uncle, Les Pickles, drove for Beehive coaches in the late 40’s early 50’s, I seem to recall that the depot was at the rear of the Adwick Post office. To my memory the early coaches had a Beehive and Bees on the side. Can any one forward any info and or photographs of these coaches please. Thanks Vic- this is getting nearer to my hazy memories. I’m not certain that we have the story right yet!